Allergic fungal diseases can present as either Allergic Fungal Rhinosinusitis (AFRS) or in Allergic Bronchopulmonary Aspergillosis (ABPA). They are both a noninvasive form of fungal disease. 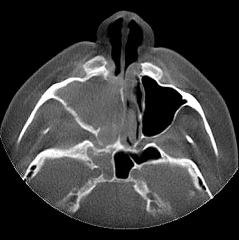 AFRS is usually seen in patients with chronic allergic rhinosinusitis who unusually presented with profuse thick mucus discharge from the sinus cavity, and patients with unusually hard to treat sinus diseases. 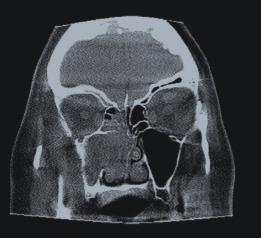 Diagnosis is made by sinus CT scan showing fungal ball as above and during sinus surgery seeing thick allergic mucin and fungal hyphae on pathology. When similar presentation is seen in the lung of asthmatic patients, it is called ABPA. Both present a challenge to physicians as those diseases are recalcitrant to treatment. A comprehensive approach using different modality of methods and medications is needed to control symptoms and minimize flare-up frequency. If you or your family have or suspect of having this condition, please stop by for a discussion to see how we could help. A multidiscipline approach involving several specialists in allergy/immunology, ENT, and pulmonology might be required to provide good care for these diseases.